More than 100 years ago, workers making next to nothing built New York City’s first subways using pick axes, dynamite, and steel wheelbarrows. At a recent trip to New York’s Transit Museum, I had to marvel at the exhibit “Steel, Stone and Backbone,” which details the conditions under which these workers labored and the shockingly limited technology that was at their disposal. Many decades later, the product of their work is still essential to the best transit system in America, and has helped make New York City the largest, most prosperous city in the nation. It makes you wonder, what’s happened to America’s ambition when it comes to building transit? About $127 billion (or 800 billion yuan) is to be directed over the next three to eight years to build 25 subways and elevated rail lines as a stimulus whose major benefit will be an increase in mobility for the rapidly urbanizing nation. 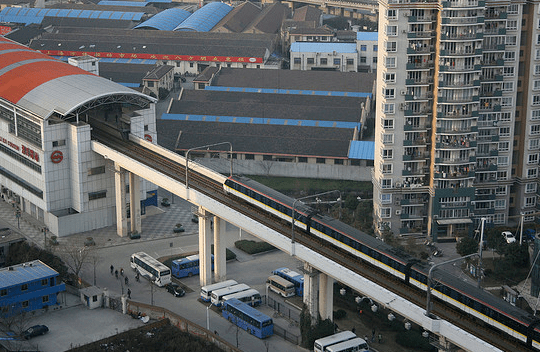 Though China’s high-speed rail network (now the largest in the world) has garnered most of the headlines when it comes to transportation there, the nation’s investments in urban rail have been just as dramatic and serve far more people on a daily basis. Its three largest metropolitan areas — Guangzhou, Shanghai, and Beijing — feature the world’s fourth, fifth, and sixth most-used transit systems, providing more than five million rides each daily, more than similar networks in New York or Paris. Most of these cities’ lines opened since 2000. Yet the government does not accept the premise that a transit network that requires subsidies is necessarily a problem, at least based on its willingness this month to extend advance (and therefore heavily subsidized) loans to municipalities building transit lines. In general, the new national aid, which comes in the form of very reduced borrowing costs, will allow for the fast-tracking of projects already in the pipeline, much as Los Angeles has hoped to do with its transit projects. On average, 42% of financing will be directed from local governments, with the rest financed by banks, all benefiting from the lower bond rates. Costs will be eventually covered through long-term tax revenue. By 2020, China will have 40 cities with metros extending 7,000 route kilometers, more than five times what exists in the United States today. Elsewhere on the Network today: Bike Portland explains that outdated street design manuals are resulting in inferior cycling treatments in Portland. Streets.mn wonders if we can start designing streets that “forgive” mistakes by the most vulnerable users instead of just drivers. And Human Transit thinks some aspects of new urbanism conflict with sound transit planning. China is building new subway lines at an astounding pace, quickly surpassing the U.S.'s legacy systems. Why Are U.S. Transit Agencies Failing to Implement Modern Train Designs?